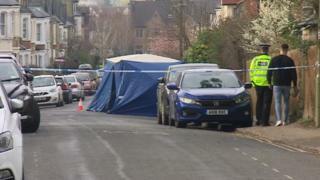 A car connected to a double stabbing in Oxford has been found by police. Two men were taken to hospital - one with life-threatening injuries - after the attack in Southfield Road at about 23:30 GMT on Wednesday. Thames Valley Police launched an attempted murder investigation and said up to 10 people could be involved. One of the victims remains in a critical condition and a 22-year-old man has been arrested on suspicion of wounding with intent. A third man may also have been hit by a car, but has not been found by police. A police spokesman said a car officers were trying to trace had been recovered. Both men who suffered stab wounds were in their 20s and were taken to Oxford's John Radcliffe Hospital. A group of men was seen running from the scene, heading away from Cowley Road. Det Insp James Senior said the road had reopened but there would be "an increased police presence in the area while the investigation continues". "I would like to reiterate that we believe this was an incident involving people known to each other and there is no identified threat to the wider community," he added.